The Grow an Extra Row (GAER) project began in 2004 as late OSU Master Gardener Gray Thompson's local version of an international project called Plant an Extra Row for the Hungry. Gray just couldn't stand the idea that so many of his neighbors in Clackamas County were going hungry. He found a garden spot in Oregon City at the Clackamas College Community Gardens, and the GAER project was born! 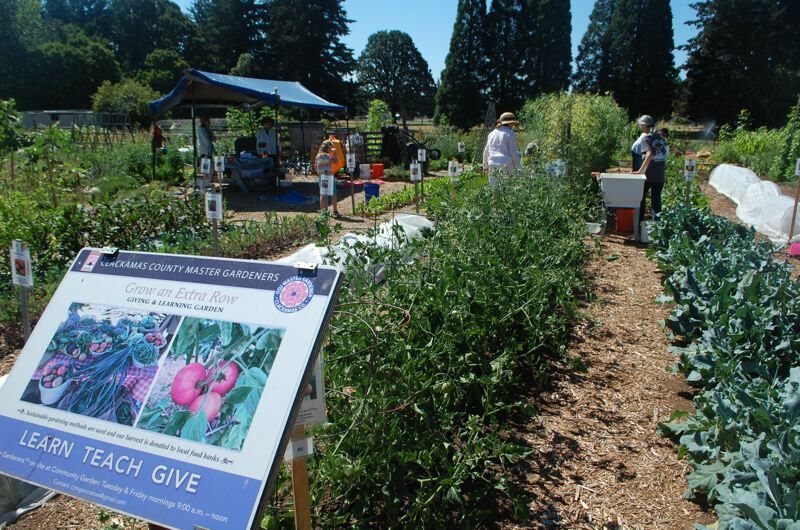 The GAER project is part of the OSU Extension Service Master Gardener program and is supported and funded by the Clackamas Country Master Gardeners (CCMGs). CCMGs don't just plan an "extra" row, they plant an "extra" garden. Gray Thompson and a few other CCMGs planted and donated mostly tomatoes, beans and squash. Over the ensuing years the group donated several hundred pounds of food to help improve hunger statistics in the county. In 2005, they expanded to two garden plots. Gray Thompson reported in chapter meeting minutes that the "Extra Row" program to help the needy produced many tomatoes, bush beans, summer squash and corn. Produce was donated to church food banks, Meals on Wheels and the Gleaners Warehouse. An approximate value of the 140 pounds of donated tomatoes was $210. The community garden plots were rented from CCC at a cost of $40. Gray's health slowed him down, and he handed off the chairperson baton to Pam Garten. Three more plots were added for a total of 3,125 square feet. The committee decided to plan, plant and care for all five plots and donate to various agencies in the local area. Although they struggled with severely depleted soil in some areas, and not the greatest of gardening years, the GAER group grew, tended, harvested and donated over 800 pounds of vegetables to area food banks and kitchens. In 2011, another plot was added bringing the garden plots total to approximately 3,700 square feet. Soil building was ongoing. Mary Butler co-chaired with Pam Garten. By this time there was a committee (Rob Folse, Bob Woods and Barb Markwell) that oversaw the project. The GAER committee established routine workdays every Tuesday and Friday from 9 a.m. to 1 p.m. They designed a brochure to share information about the project with other Master Gardeners, interns and the public. The committee also started a record-keeping system for dates, poundage, activities, etc. They also developed a garden map to keep track of plantings and crop rotation. The group held an Open Garden event on July 23. The committee designed and printed T-shirts with the logo "Learn, Teach, Give, Grow an Extra Row, Clackamas Co. Master Gardeners." GAER donated 1,908 pounds of produce to local food pantries. During the growing season 21 volunteers worked 692 hours. GAER donated a total of 2,406 pounds of produce to H.O.P.E. at First Presbyterian and First Baptist Church, Tualatin School House Pantry, Oregon City Community Basket and Milwaukie Center Meals on Wheels. During the growing season a total of 20 volunteers, spent a total of 744.8 hours over the 62 days of garden work parties. Two more plots were added so there were now five plots on the B side of the garden and two on the C side. The committee members were Mary Butler, Barbara Markwell, Bari Bilyeu and Nancy Muir. GAER donated 3,314 pounds of produce and had 23 volunteers who spent 663.75 hours during the 56 days of growing season. The retail value of the produce was approximately $6,195. One more garden plot was added for a total of about 5,000 square feet. They started a three-year project to upgrade the irrigation system from soaker hoses to drip tape irrigation. The utility area was moved to the newest plot. The garden became a demo garden and expanded the name of the project to Grow an Extra Row Giving and Learning Garden (GAER G&LG). The project developed the mission statement, "Grow an Extra Row Giving and Learning Garden will grow and give quality food to help people on a limited budget meet their food needs and teach adults how to raise their own healthy food." A sign was made and installed at the garden to inform people about the project and the work schedule at the garden. Some of GAER's larger vegetable donations during 2014 were 1,512 pounds of tomatoes, 193 pounds of green beans, 156 pounds of cucumbers and 215 pounds of summer squash. The work parties continued to be on Tuesday and Friday mornings with donations going to the H.O.P.E. First Presbyterian food pantry on Tuesday and the H.O.P.E. First Baptist food pantry on Friday with occasional donations to Milwaukie Center and Pioneer Center. Eve Freeman became one of the team leaders, joining Bari Bilyeu and Nancy Muir. Donations were 3,023 pounds with 24 volunteers working 759 hours during the 59 days of the growing season. Retail value of the donations was $7,429. In the spring, they co-hosted a "Welcome to the Garden" for the gardeners who rent plots at the Clackamas College Community garden. They offered to deliver other gardeners' extra produce, and 214 pounds of this extra produce was delivered to the food pantries during the season. During the growing season, they arranged for two presentations at the garden on garden-related topics. Other community garden gardeners, Master Gardeners and the public were invited to attend. One of the volunteers made a cover for their utility area to shade from sun and rain while weighing produce and/or recording information. They became a Seed to Supper host and taught a six-week gardening class in the spring. Seed to Supper is a joint effort of the Oregon Food Bank and OSU Extension Service Master Gardener Program. It is a comprehensive beginning gardening course that gives novice and adult gardeners the tools and confidence they need to successfully grow a portion of their own food on a limited budget. Donations of 3,554 pounds of produce went to H.O.P.E. First Presbyterian and First Baptist food pantries, the Milwaukie Center and Pioneer Center. During the season 29 volunteers worked 840 hours during the 56 days at the garden. They delivered 614 pounds of produce donated by other gardeners. The Welcome to the Garden event was co-sponsored by GAER and the coordinator of the CCC Community Garden. They arranged for three presentations at the garden and invited other community garden gardeners, Master Gardeners and the public to attend. An Open Garden event was held. The drip-tape irrigation project on all 30 beds in the garden was completed. They donated 3,828 pounds of produce to H.O.P.E. First Presbyterian and First Baptist food pantries and occasionally to the Milwaukie Center and Pioneer Center. The H.O.P.E. First Presbyterian food pantry serves about 80 families each Tuesday and First Baptist food pantry serves about 50 families each Friday. The produce had an estimated retail value of $12,367. During the 56-day season 35 volunteers worked 1,015 hours. They delivered 699 pounds of donations from other gardeners to the food pantries. They organized the Welcome to the Garden event again and arranged to have two presentations at the garden — Growing Tomatoes and Organic Gardening. One of their volunteers convinced them to not use plastic bags for produce delivery. So, she applied for a Gray Thompson Grant from CCMG and received $150 for supplies to make about 120 cloth bags. She recruited some volunteers to help assemble the bags and wash the bags between uses. The cloth bags are better for the environment, sturdier than plastic, and it is easier to weigh the produce. All of the vegetables are grown from seed or transplants. Many of the transplants are grown by volunteers. Each year five varieties of tomatoes are grown, plus six tomatillo plants. Each tomato variety is planted in its own 25-foot bed — each of the 12 plants in the bed is caged. Tomatillos are planted in half of a bed. Row cover is used to protect the young plants and for pest control. The garden season is the first of April to mid October, when all the beds are winterized. The soil is sampled and tested every two years and organic fertilizer is applied per the results. All of the garden is on drip irrigation with timers to control the day and length of watering. The garden beds are on a four-year crop rotation. In January of each year a seed-selection meeting is held to evaluate the previous year's vegetables and varieties and decide what will be planted the next year. Extensive record keeping is done to record all aspects of the garden.